I knew she was kidding, but I was stupid. And the real stupidity was that I had run out of gas along Utah’s Provo River with a truckload of fishing gear, but not one fly rod! I had sent a call for help, but it would be over an hour before my wife came to my rescue. With nothing better to do, I grabbed a streamer from the dashboard, pulled a lanyard from the backseat, and slid down the embankment to the river. The water was a little high and a bit murky, but the edges looked fishable. I remembered my dad’s frequent telling of how he had fished with willows or, once, a broomstick when faced with no other options. I didn’t see that I had any options, so decided to find myself a willow. Finding them wasn’t hard, but dismembering them was. I didn’t have a knife, so we wrestled. In the throes of my fight, I glanced across the river and saw a husky boy sitting on a bench near the paved trail that follows the river. As bikers rode past, the boy fiddled with his roller blades. I could see him peeking at me, a curious expression on his face. I ignored him. Just then, a potato-sized ball of aluminum foil came bobbing down the river, and right next to me, a foot-long brown trout struck at it. That did it! I abandoned my fight and hefted a large, dry tree branch to which I tied a length of 3X tippet. I tied my four-inch-long, tungsten-head streamer to the tippet and swung the fly over the river. The fly swung toward the bank, and immediately the foil-eating fish flashed, but he didn’t take it. I dragged the fly past a large rock. Another brown, larger, nailed the fly, but my hook set snapped the tippet. With my frustration now tempered by excitement, I climbed back to the camp trailer I had been towing. I hoped to find a tip section of my kid’s spinning rod, but I found only a garden-variety hot dog fork, with three prongs at one end and a wooden handle at the other. 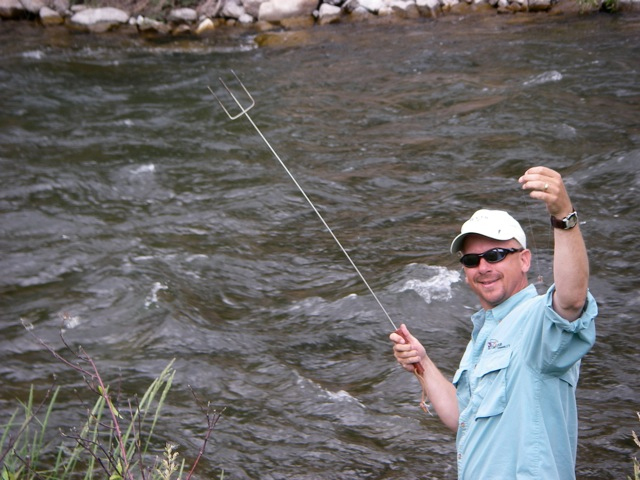 I subjected the fork to the wiggle test: it was about a three-and-a-half-foot, 26-weight, one-piece rod. Not perfect, but. . . . I tied on my tippet and then a Stimulator dry fly. As I skidded back down to the river, I noted that two middle-age female walkers had now joined Skater Boy near the bench, and that his gaze was no longer surreptitious. My tippet and fly must have been invisible to them. Surely I looked mad, first waving the fork over the river and then—with my fly snagged behind me—dropping the fork to tear at the bushes. Eventually, I took the trident in my left hand and threw the fly with my right. My second “cast” landed in a seam of current where, in a move demonstrating more compassion than I would have believed a trout capable of, a chunky brown rose and inhaled my fly. I set the hook, and the fight was on. As the fish leapt, my audience lost all inhibitions and rose to their feet, which prompted two additional walkers to join them. I still ignored them, but now I did so with a sense of vindication. 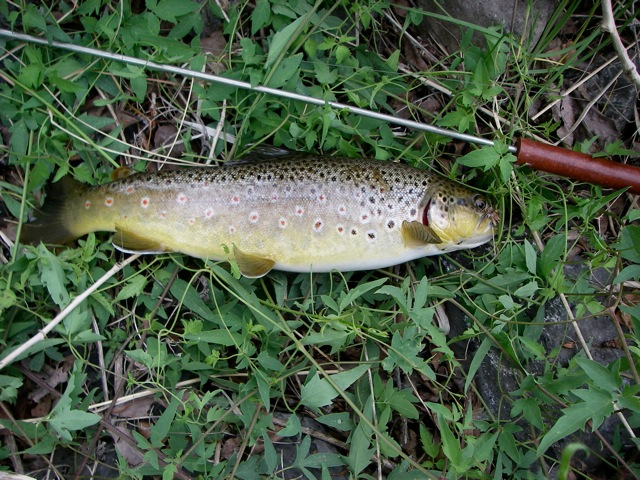 As the fish ran, my “rod” gave enough to slow it without breaking the tippet, and he tired. crazy behavior in the eyes of those watching from across the river. As the 14-inch brown came to my feet, I discovered an unanticipated problem: even with my rod arm fully extended above my head, my wingspan wasn’t long enough to reach the fish. After two failed attempts at stretching my frame, I led the fish’s nose to the grass, grabbed the tippet, and held the fish in place while I dropped my fork and gently lifted the brown from the water. I raised the fish upward toward the far bank, and my audience immediately broke ranks and dispersed, as though they had been caught peeking into a bedroom window. I managed to get the traditional photo with my catch lying on wet grass next to my “rod.” The fish’s mission of mercy complete, I released it. Just then my wife and daughters appeared on the shoulder of the highway. I told my heroic story and proved it with the photo. My daughters still teased me about being stupid, but the story now had both stupidity and conquest. Bryan Eldredge is an Orvis-endorsed guide (and former Trout Bum of the Week) who works at Falcon’s Ledge in Altamont, Utah. There he goes, hot doggin’ it again!